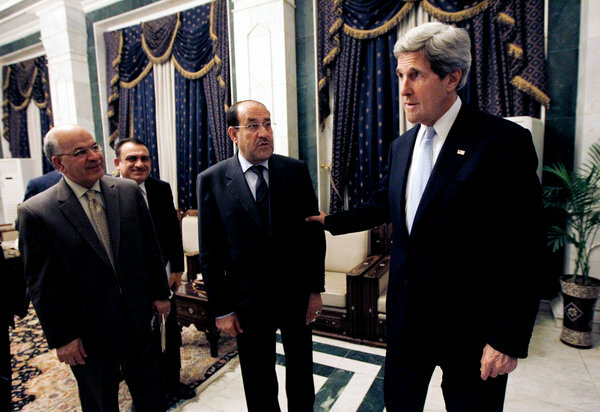 Prime Minister Nuri al-Maliki of Iraq told the Obama administration this month that Iran was interested in direct talks with the United States on its nuclear program, and said that Iraq was prepared to facilitate the negotiations, the New York Times reported today, quoting Western officials. In a meeting in early July with the U.S. ambassador in Baghdad, Mr. Maliki suggested that he was relaying a message from Iranian officials and asserted that President-elect Hassan Rouhani would be serious about any discussions with the U.S. In a separate move on Thursday, the State and Treasury Departments announced that the United States was expanding the list of medical devices, like dialysis machines, that could be sold to Iran without a license. Maliki is more Iranian than many Iranians and lived in Iran for nine years as after Saddam lost at Khorramshahr in 1982, he started cracking down on Shias after an assassination attempt on him and the babbling idiot Tariq Aziz. Maliki was one of the key figures in forming the Shia Dawa party and Badr Brigades under the command of Sepah officers and speaks fluent Farsi. Iran is very lucky to have him in power in Iraq as he understands both Iran and the US dilemma with Zionist control over US policy. The great nation of IRAN should be very careful and at once never trust at all when it comes to dealing with the so-called world's Zionist warmonger of the most arrogant, boastful and bully nation of the U.S.
Maliki is not the subject here; he’s only the messenger. The topic for discussion is why Iran would want to push for bilateral talks so soon after the election, even before any P5+1 meetings. This is a very interesting development. We’ll take the comment not as sarcasm but as a compliment; but we did not have anything to do with Maliki’s message! Interesting observation. Then why the government wants to start the talks? yes, mat, Iran has to be very careful indeed when trying to end the harmful and humiliating sanctions placed upon it by asking for direct talks with the world's foremost military power and the organizer of those sanctions. in order to have the request for direct talks taken seriously. It is beyond delusional to even fantasize that Iran and the decaying Zionist enslaved failed carcass of US can ever negotiate anything meaningful. The Arab world is imploding and the US stasi police state itself is in mortal peril. Those who harbour childish illusions are in for a huge disappointment like their 35 year old pipe-dreams of "regime change" in Iran. The US is not worth engaging and this drama will continue until eventual US collapse. Most mature nations now have discounted the US as a global irrelevancy.